It began with a chant. In a small house off Rouse Road, in the center of the shrine room's wood-paneled floor, a bald man in saffron robes shifted from foot to foot, singing the words of his faith: hare krishna, hare krishna, krishna krishna, hare hare, hare rama, hare rama, rama rama, hare hare. It's a form of worship called mantra meditation. It's one among a number of methods of devotion practiced by the members of the International Society for Krishna Consciousness — known colloquially as the Hare Krishnas — as a means to come closer to their God and a state of mind called Krishna Consciousness. "Chanting clears the mind; it's a way of attracting God to us," said Trivikrama Swami, the temple's elder acolyte. "People falsely believe they are at the center of the universe, so Krishna created the physical world to fulfill that belief. Chanting reminds us that we are not the center of the world, that there are things greater than us in the cosmos." Trivikrama Swami has been an initiated member of ISKCON since 1966. Since his initiation, when he swore to remain celibate and devote his life in service to God, he has traveled the world — Japan, Korea, Poland, England and more — before placing his roots at the ISKCON Temple here in Orlando. "I felt that, well, I've been all over the world, I've practiced in pretty much every country, but I figured I'd be more effective here, as an American," Trivikrama Swami said. "After my spiritual master left the world in 1977, we [his disciples] had a bit of leeway to choose where to go and practice." 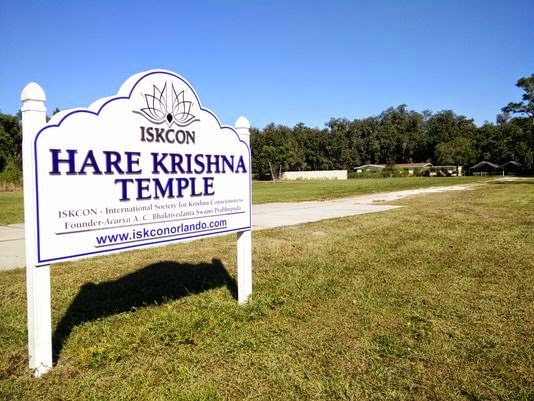 The ISKCON Temple in Orlando was established in 2003, though its members have been practicing in the local area for many years beforehand, using space provided at various Hindu temples in the local area. The temple boasts a shrine, vegetable garden, community kitchen and living space for its six resident devotees, in addition to serving as the community's focal point for festivals and high holy days. Life for the temple's resident devotees begins promptly at 4 a.m. They wake, wash and begin chanting on a string of prayer beads before the temple's first service at 5 a.m. Service lasts for two hours, after which devotees may tend to the garden, study or prepare food prior to the evening ceremony at 6 p.m.
Services are open to the public, and often students from UCF appear among the temple's regular cast of members to experience firsthand the Hare Krishnas' unique form of worship. "I thought everyone was so open, enthusiastic and happy about their worship," said Andrea Sullivan, a freshman international and global studies major. "It's very different from what I'm used to [as a Catholic] where everyone is so serious and formal." In addition to its ceremonial services, the temple supports a student organization called the Bhakti Yoga Club. The club provides a means for students to practice mantra meditation and to learn more about the Hare Krishna faith. For international students such as Naman Mehta, a master's candidate in optics and the Bhakti Yoga Club's current president, it provides a link to his home in India. Mehta, a practicing Hare Krishna, moved to America to study at UCF. The club and the ISKCON Temple provide him an outlet for stress and a way to place his life into a larger context. "I focus on one simple thing: I try my best, to the best of my ability, to serve him [Krishna]," Mehta said. "Everything else follows from that. Sometimes I don't know how I can do it — the studying, the club, moving from India. So long as I believe, so long as I worship, I know that whatever happens is the best for me."